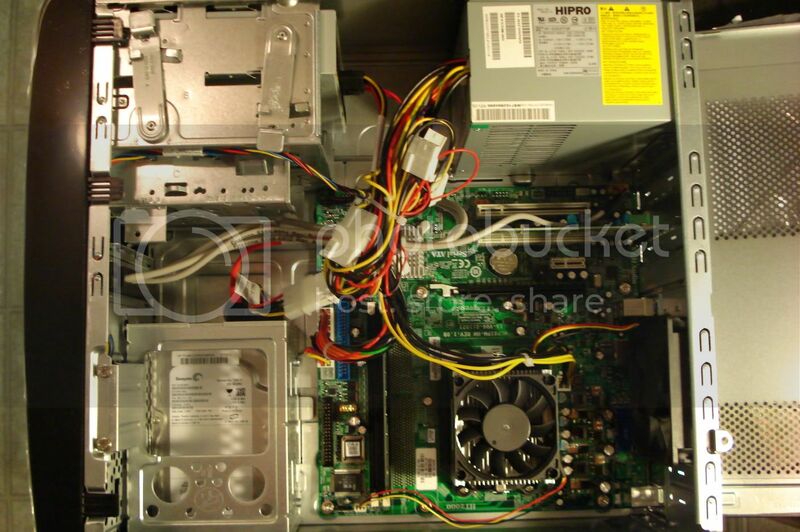 Project "Oscar the Grouch" - the $500 gaming PC project. Well, Christmas is fast approaching and I had purchased gifts for just about everyone. I was leaving work after a solid 13-hour shift when I noticed one of my co-workers putting out a clearance sign for a computer for $147. I thought to myself, "Hmmm, my brother has been saying he wants a computer of his own for a while now." 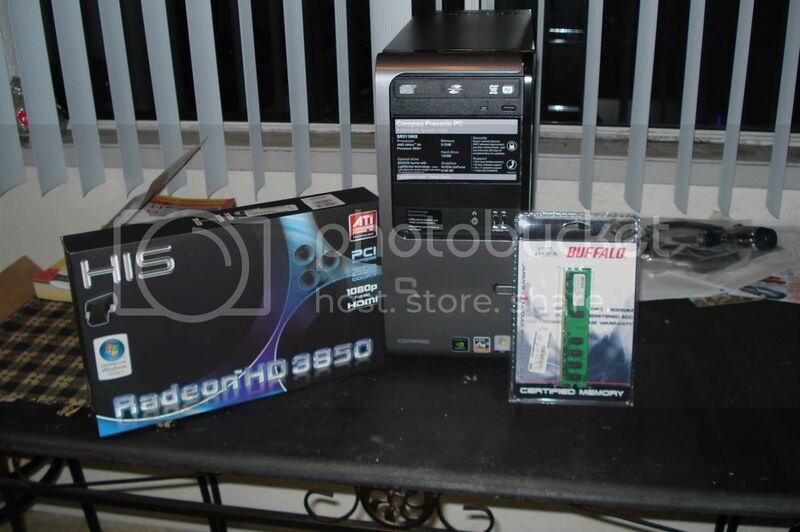 The computer was a Compaq Presario SR5110NX w/ an AMD Athlon64 3800+, 512 MB of RAM, 120 GB HDD, Nvidia integrated graphics, and Windows Vista Home Basic. I went to the back and opened one up to see what it had inside and everything seemed to be okay except the motherboard was made by ECS. 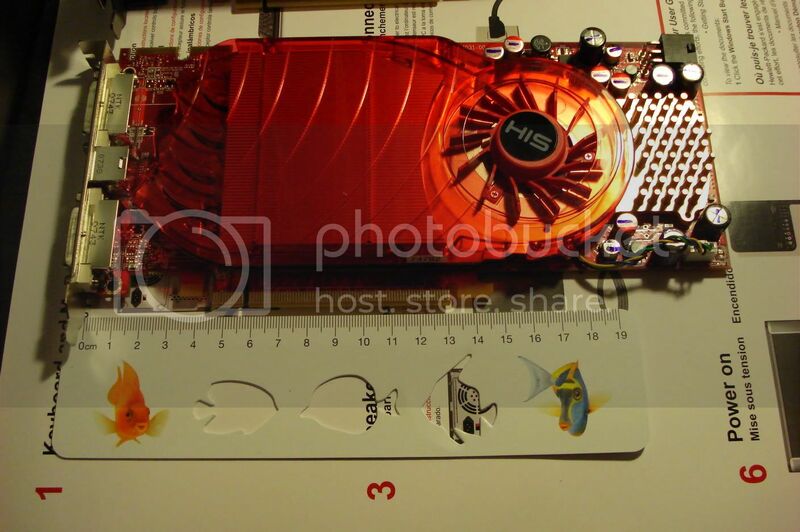 It has the nForce chipset, so I assumed it had a PCI-E x16 slot and it looked like it would have enough room to fit a decent-sized GPU in there. I decided to do a bit of research and sleep on it. After not doing any research, I immediately went to the store the next morning to pick it up for $125 after staff discount and then immediately phoned up HP to see what kind of CPU I could swap into it. Well, I spent about 2 hours on the phone w/ several HP reps based out of India where they told me that my computer was out of warranty and I would be charged $60 for the call (I hadn't even opened the freaking box yet AND it has Vista, which is less than 1 year old, so how the hell it could be out of warranty is beyond me) and then, after that debacle, attempted to explain to them what I was planning to do, to no avail (scripts apparently don't have motherboard specs w/ a CPU support list). I gave up on trying to get any answers from HP and decided I would try to figure it out on my own, so I went into the box to see if, by some miracle, HP actually included a manual (they didn't), but what I did find ended up actually helping me. A card w/ an address for online chat support. I logged in and was greeted by an HP rep. I explained to him the nightmare-ish situation I had just been through on the phone and told him straight up that if he wasn't technically-inclined, to just tell me now and save us both the time and hassle. He said he was fairly confident he would be able to answer my questions and, much to my suprise, he was actually able to tell me that it supported up to the 4800+ and was able to answer my other questions (Mobo doesn't support dual channel, mobo has a true PCI-E x16 connection (some Intel boards have a x4 electrical connection in their PCI-E "x16" slots), BIOS can't be flashed to support faster CPUs, Windows-based CPU overclocking not supported, etc.) . GOLD ! Now knowing what the computer could handle, I set out to create a parts list. 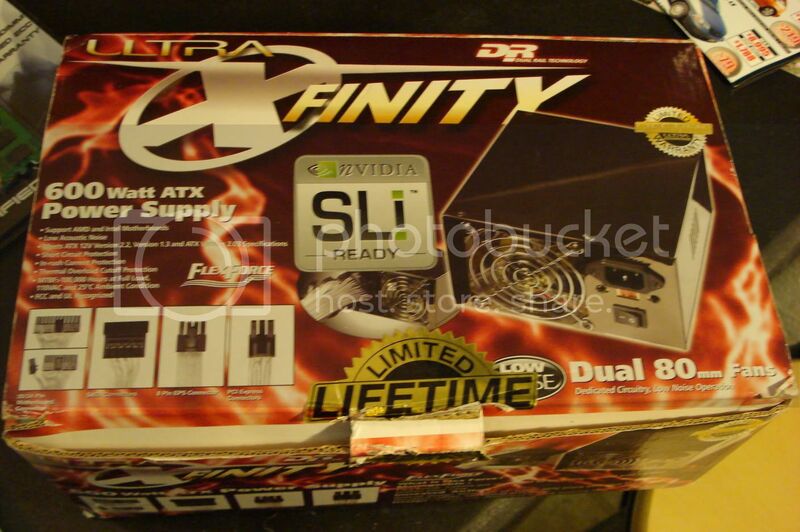 I had a spare 600W Ultra X-Finity power supply laying around that I picked up from a friend for $30 (he paid $60 for it, didn't want it because it was too loud), so that was already taken care of. Knowing the mobo doesn't support dual channel, I decided to pick up a single 2 GB stick of PC2-5300, which NCIX had on sale for $45. The 4800+ goes for $100. That left me w/ a shade over $200 to cover the GPU and taxes. I was contemplating picking up an HD 2900 GT, X1950 Pro, or 7900 GT because all the HD 3850s were going for $190-ish on NCIX. I tracked down an HD 3850 for $170 at another online store and made use of NCIX's pricematch policy, which brought the grand total to slightly under $500 (~$530 if you take into account the PSU I already had). Okay, so I got the RAM and GPU today (oddly enough, the CPU was not shipped and was not charged through). 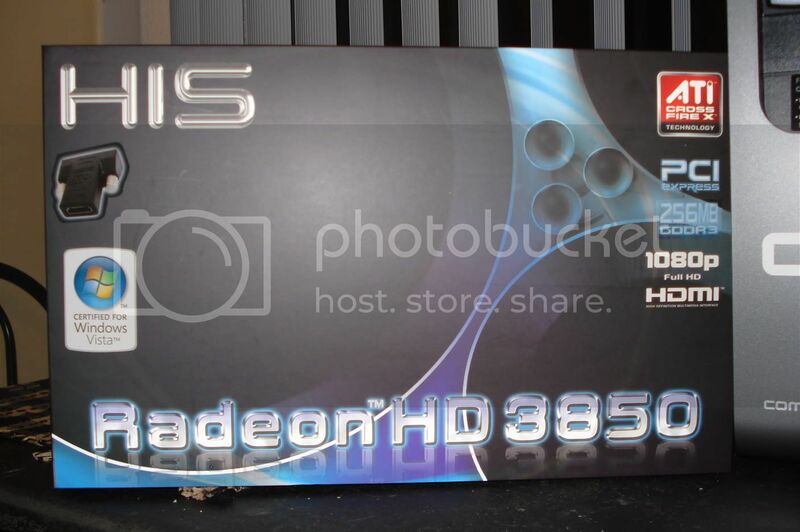 * Installation was a major pain in the rear end as I was not expecting the HD 3850 to be as large as my 8800 GTS. * Combined w/ a 600W SLI-capable PSU (tons of connections) that has extra-long cables, it made for some very interesting and ugly installation work. * Basically, most of the cables are crammed in the only decently-sized empty spot I could find, which is the hard drive bay. Looking good so far, other than the CPU (which will be upgraded when it arrives). * Graphics scores are maxed out, showing promise. I then installed 3DMark06 and attempted to run it. * Unfortunately, it kept locking up on me. 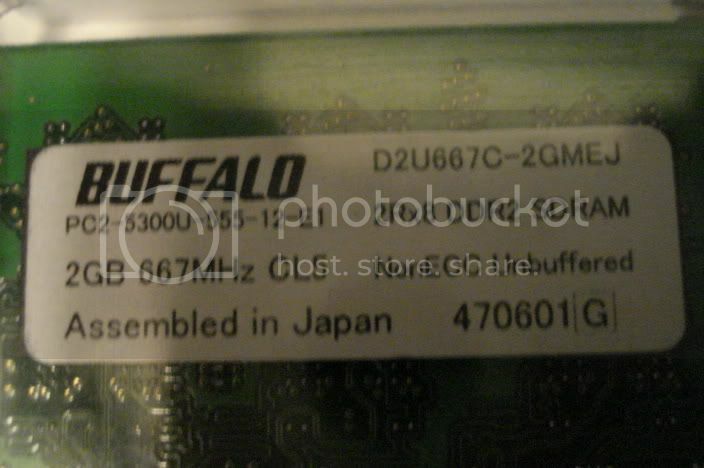 * I checked out Futuremark's site to see if there was a newer version and discovered there is a hotfix available to solve compatibility issues w/ the new 8800 GT(S) and HD 3800 series cards. * After installing the patch and restarting the computer, I then ran the benchmark. * It scored a 5720, which is okay (I forgot to take a screenshot) ...* certainly nowhere near what the HD 3850 is capable of, but a hell of a good score considering I have less than $400 invested into what's currently running. 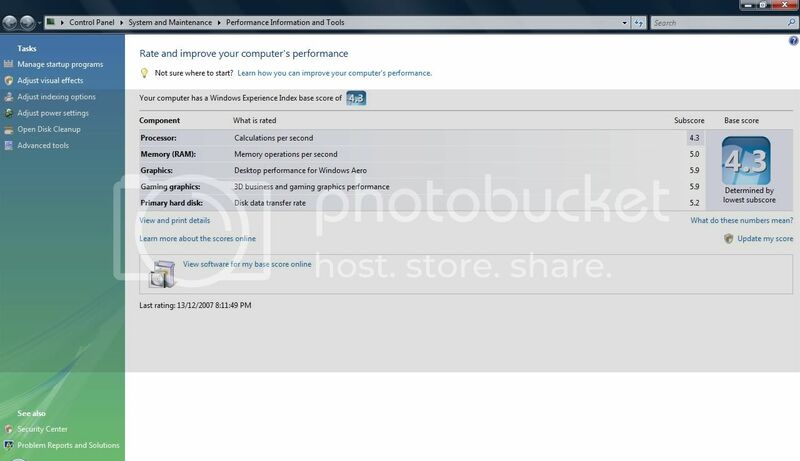 * Keep in mind that the CPU score was less than half of what my stock 3800+ X2 scores in XP (as I've said time and time again, single core CPUs have no business running Vista). * The HD 3850 actually beat out my 8800 GTS by a small margin in the SM 3.0 section, although the 8800 GTS won the SM 2.0 section by a small margin, so they were pretty even. * When I get the 4800+ X2 in, I expect it to hit a minimum of 7000. Shot of everything (except the PSU and CPU) before installation. 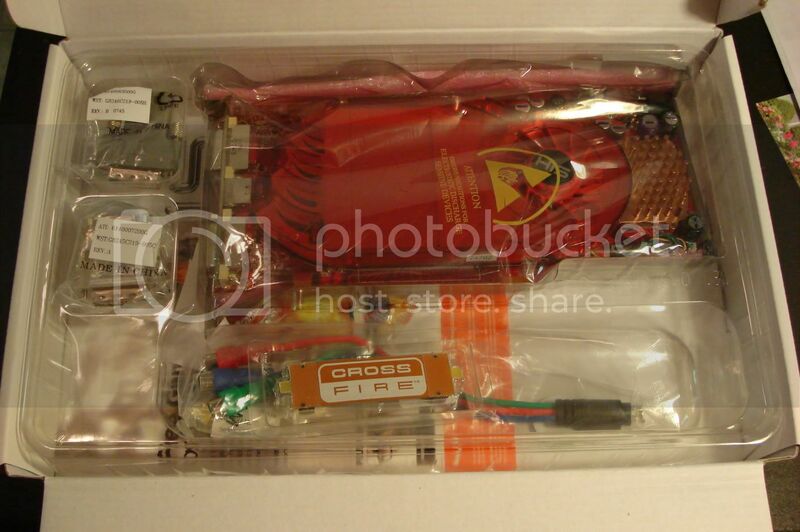 Graphics Card Box - Pretty plain for such as fast card. 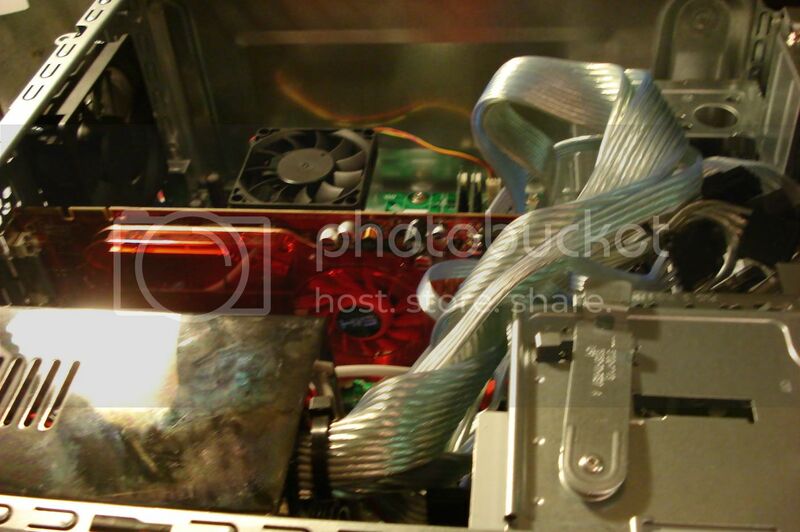 Memory ...* No fancy heatsinks, so I just took a picture to show what it is. 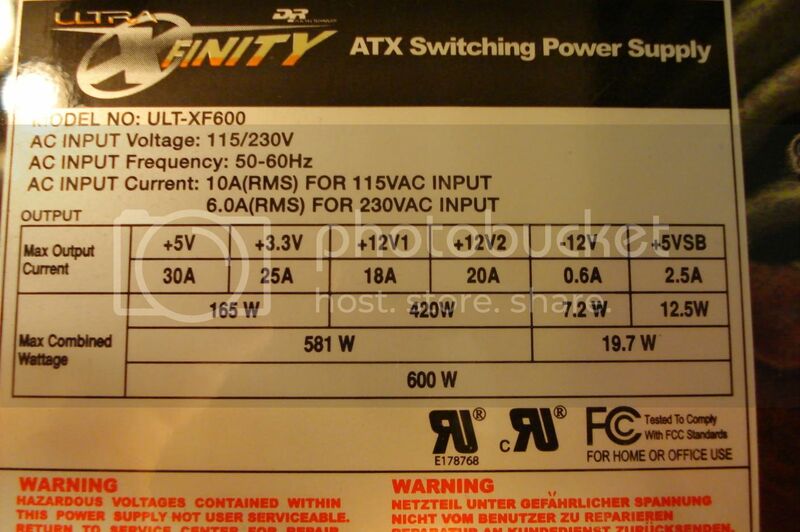 The power supply - Ultra XFinity 600W PSU. 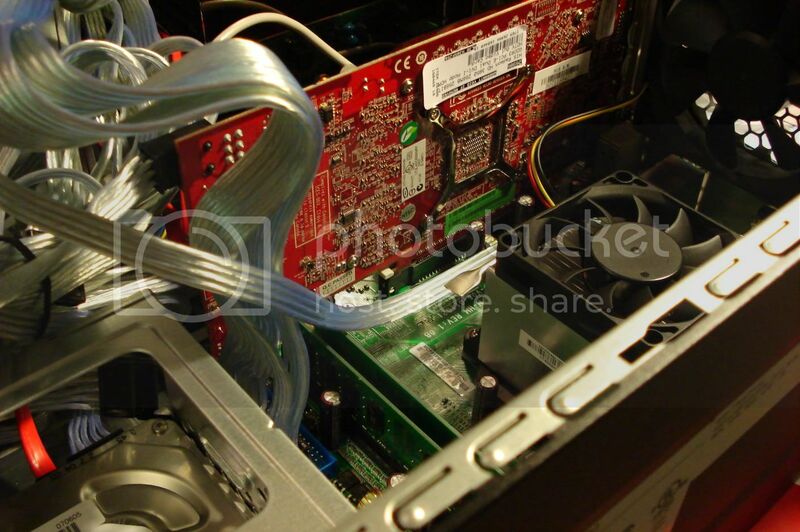 * Very nice PSU, well-built (copper heatsinks inside, 105*C caps, lifetime warranty), tons of connections and long, flexible cables. * It is pretty loud, though, despite the Low Noise advertisement on the box. 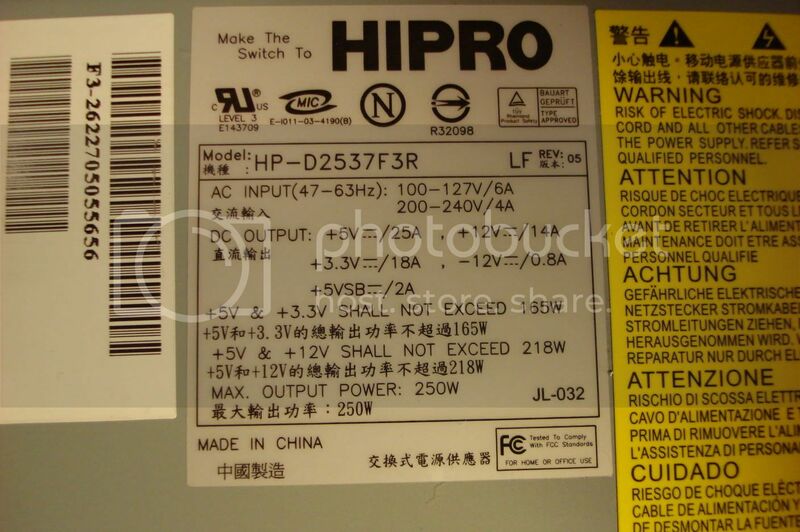 Stock PSU - Hipro 250W ...* Enough power to power what's in it. * Don't even think about running even a basic graphics card off this thing. Inside the GPU box - HDMI adapter, VGA adapter, Component adapter, CrossfireX connector, and, of course, the main attraction. 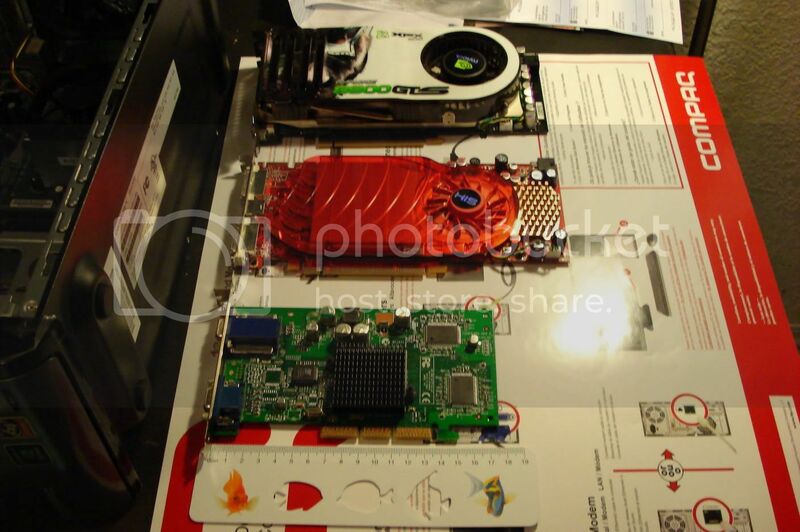 Pictured - 8800 GTS 640 MB, HD 3850 256 MB, and GeForce4 MX 440 64 MB. 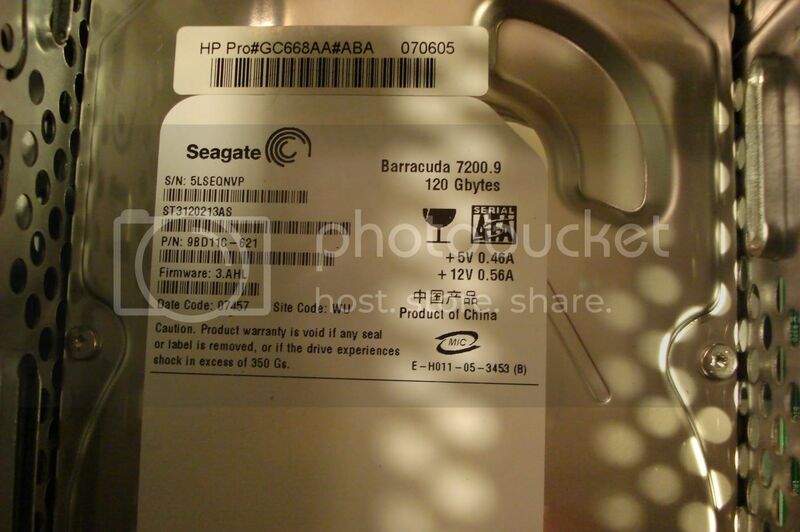 * I couldn't find my old Ti4200 for reference and my new 7600 GT hasn't arrived back from Gigabyte yet. 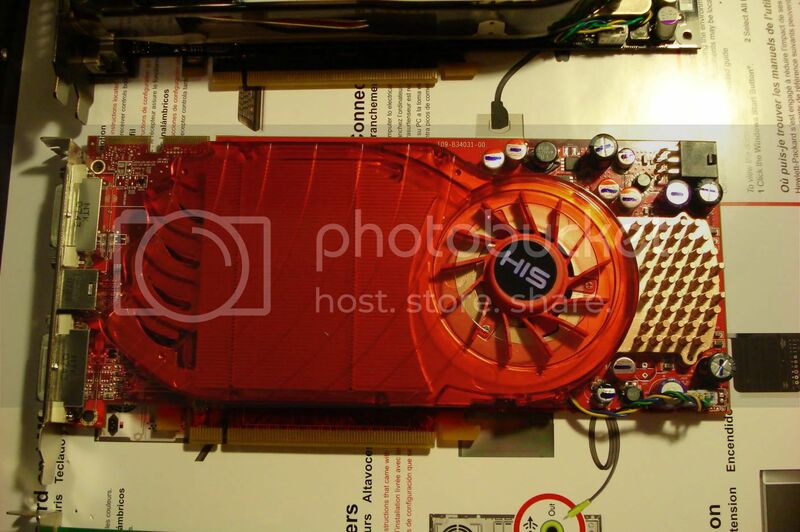 * These high-end cards are massive compared to cards from a few years back. Close-up of the HD 3850 ...* Very nice looking card, although very ...* vibrant (although that's usually the case w/ ATI cards). * I would've liked to have seen all solid caps and a dual slot cooler, but I guess you can't have everything when you're only spending $170. Pic from the side of the cards. HD 3850 beside the only ruler I could find. * Junk mail comes in handy sometimes. 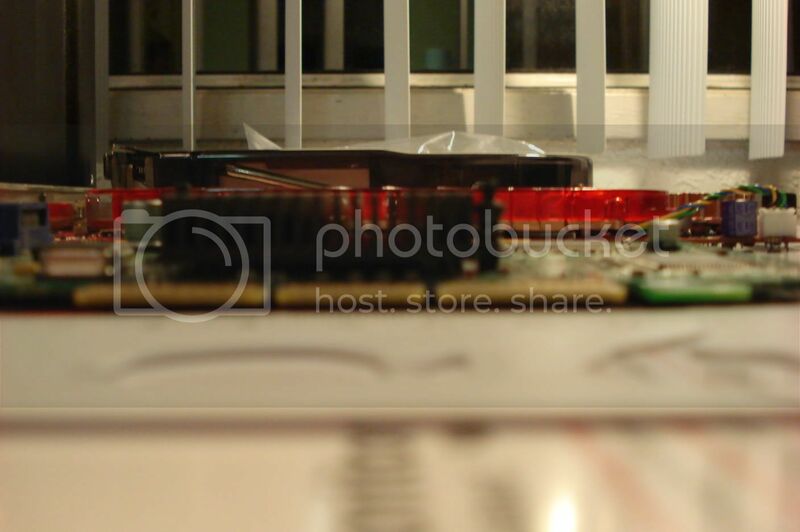 Top shot of the case. 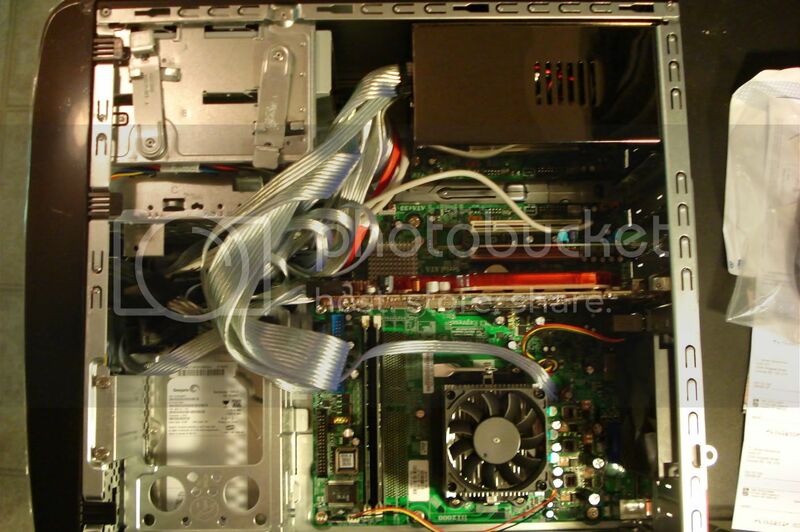 * Like I said, I stuffed the cables where they would fit, which is right at the hard drive bay. * You can't really tell from this angle, but the cables are compacted as much as possible so I can get the side of the case back on. Top-Font of the case looking toward the bottom-rear. * This angle gives you a better idea of how cramped it is. More to come when I get the CPU upgrade in. Last edited by Jmac; December 14, 2007 at 01:28 AM.